I’m not knocking Pinterest. (Please, no hate mail.) The tool is not really the problem. The mentality of how people thoughtlessly and mechanically use this tool IS the problem. Many of us work really diligently to teach our students to be digitally literate: navigate digital environments, think critically, access and analyze digital information, and produce creative and relative digital content. Part of digital literacy also includes digital citizenship and understanding intellectual and creative property of digital content. You see a photo online? Someone took that photo, and THAT person owns the rights to that photo. You do not have the right to use that digital photo. Same thing with music, art work, writing… we know this. It’s not okay to use someone else’s work without explicit permission. Even WITH permission, there are still restrictions on how and when you can use that work. So, back to Pinterest. Pinterest is that tool that allows you to easily (too easily, in my opinion) curate sites you want to save: recipes, fashion, quotes… you name it. When you save a pin, it scans the website for all photos to use as the “face” of that pin. In the case of a photo, the photo itself is saved as the pin, but the OWNER’s information is not saved with the pin. And then the photo is repinned. And repinned again. And repinned again. The 500th person to repin that pin may or may not have access to the original site where that photo was posted. There is absolutely NO trace back to the owner. Two years ago, I found on Pinterest an education poster that I wanted to revise and use in my classroom. I spent DAYS trying to track down the original creator of the poster to no avail. You can read my post about the need for ATTRIBUTION and the rest of that story here. To this date, I still do not know who created that poster. And guess what? My version of that poster- the one that I drew based on that original poster? Now MY POSTER is being shared, reshared, and pinned without attribution. We are two levels deep in sharing without properly crediting the work that was created. This is the Pinterest Mentality. We don’t even think. We pin. We retweet. We don’t stop to make sure that someone’s intellectual and creative property is respected enough to ask permission to use OR even to include the creator’s name with the work. And I hate to even type this, but educators are some of the worst offenders. 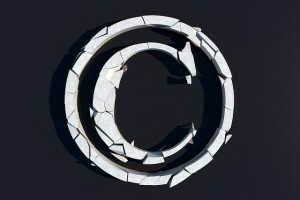 Fair Use does not exempt us from all copyright restrictions. “It’s for education” is not an excuse. Pinterest (and tools like it) makes it really easy to ignore the owner of the “work” being pinned… but that doesn’t mean it can’t be done. If you teach your students not to plagiarize, they should also be learning that they can’t use creative works without permission. The adults need to learn this, too. Model appropriate use and respect of the work of others. If you want to share something (or repin), be sure to add attribution somewhere in the description of what you’re sharing. Digitally literate and respectful educators shouldn’t be the exception… we should be the norm. I need to get better at updating this blog! Hoping I can get back into the swing of things starting with a goal of weekly blogging. Perhaps I’ll get back to daily updates after the new year… but my lack of writing is not the point of this post. Lately, in education networks, I’ve noticed a lot of advertising for tools to catch students plagiarizing. It’s a pretty big business. A quick Google search for the terms “plagiarism detector” results in 1, 350,000 returns. Many school districts, including the one I left this past year, have spent a lot of funds on tools such as Turnitin.com. I’m always skeptical of businesses who make a lot of profits on tools designed to catch students (or anyone for that matter) doing something wrong, unethical, etc. Internet filters, monitoring systems to, for lack of a better term, spy on kids’ online– I’ve seen the vendors for many of these companies at ed tech conferences, and it amazes me that school districts spend SO much money on something that, in my opinion, is not worth the expenditure. Reactive products, especially those that generate a lot of profits, have no interest in resolving the issue in the first place. 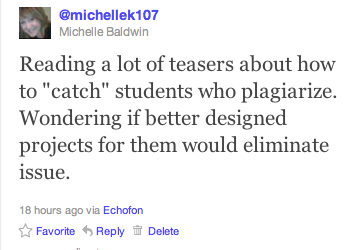 Turnitin, and others like it, don’t benefit from teaching students NOT to plagiarize. In fact, advertisements for internet filtering tools and plagiarizing detectors sensationalize the problems to ensure that those with budget authority feel the need to spend massive amounts of money to catch those in the wrong. Plagiarism is obviously something we need to help our students learn about. WE know it’s wrong to plagiarize, and it’s our duty as educators to ensure students know that it’s wrong. But this is where I think we fail… by implementing tools to catch them doing something wrong instead of educating WHY it’s wrong seems like a setup. The other issue is that I think that a lot of plagiarism could be easily avoided by changing the activities we ask kids to do. There is such a huge focus on secondary research for kids as early as primary grades, and that lasts throughout post-secondary education. Why? Yes, knowing how to research is a skill we all need, and learning to properly cite sources is important, too. But I think the emphasis on secondary research instead of primary research is completely unbalanced. Don’t we WANT our students to discover and inquire about things that haven’t already been researched? What about activities where kids create and produce their own works? I would much rather have my students create new, original works than spend their entire school career ONLY reading the research of others. If we want our students to become problem-solvers, that balance has to change. We can’t always find new answers or new solutions to problems if we only look at the work that has already been done. Additionally, when kids are creating and producing their own work, they will then begin to understand ownership of work– and this will help them learn more organically why plagiarism is wrong. I’m planning an experiment with my students where I will have them create something original– a drawing, a story, a song… whatever they choose, and then I’m going to post it as MY work (temporarily, of course) without giving them credit. This activity will help them understand ownership of work and how important it is to ensure credit is given where credit is due. I teach mostly 3 and 4th graders now, but I’ve taught every age of child in K-12 schools. This activity can be used with any age student, not just younger kids. I know this, because I’ve done it before… and it WORKS. The more my students created and produced their own work, the more likely they were to remember to cite sources in secondary research of the works of others. Balancing secondary research with primary research and creating original works is key. One of the arguments about the necessity of secondary research is the amount of secondary research required of students in post-secondary education. This argument is ridiculous in my opinion. We should continue practices that are not in the best interests of our K-12 students’ learning because of continued practices in post-secondary that are not in the best interests of undergraduate and graduate students? Please note that I am NOT advocating that we discontinue all secondary research in the K-12 level. Rather, my point is let’s do a little less secondary research and focus more on creating and producing original work. Balancing between these two will do more to overcome the issue of plagiarism than punishing a student after he is caught. Assuming that students will intentionally plagiarize is yet another example of how little we trust students to do the right thing… and also how little we value children and their learning. I welcome you to share your thoughts with me in the comments and tell me if I’m way off base here. Thanks.